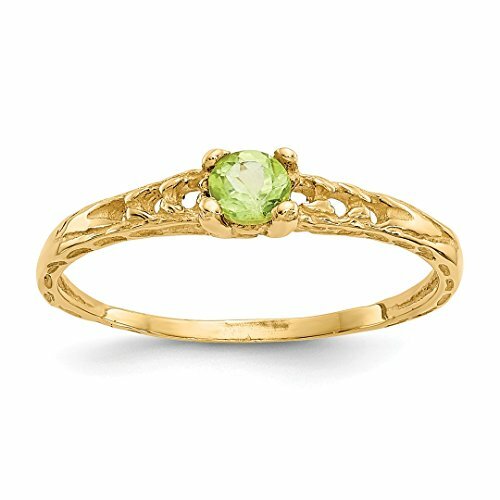 ICECARATS DESIGNER JEWELRY 14K YELLOW GOLD 3MM GREEN PERIDOT BIRTHSTONE BABY BAND RING SIZE 3.00Material Purity : 14KStone Type 1 : PeridotStone Color 1 : GreenStone Quantity 1 : 1Stone Setting 1 : ComponentStone Weight 1 : 0.120 ctMaterial : GoldStone Shape 1 : RoundStone Size 1 : 3.00 mmStone Treatment 1 : Not EnhancedWidth : 3 mmProduct Type : JewelryJewelry Type : RingsSold By Unit : EachMaterial Color : YellowRing Type : BirthstoneStone Creation Method 1 : NaturalStone Type (Other) 1 : Side Stone Mounting(s)Birthstone Month : (08) AugustOUR MISSION & BELIEFSOur mission at IceCarats is to celebrate our customers and enhance their lives journey, honoring life's memorable occasions and enhancing the beauty of everyday through our extensive collection of quality jewelry.THE ICECARATS STORY - CRAFTSMANSHIP...QUALITY...VALUEJewelry is our passion - IceCarats is devoted to craftsmanship, quality, and value. Each piece hand stamped for authenticityMADE WITH LOVE FROM US TO YOU - QUALITY WITHOUT COMPROMISEWhen you purchase jewelry from the IceCarats collection, you buy with confidence - Lifetime Warranty and 30-Day Returns .ELEGANT GIFT PACKAGING - JUST ANOTHER REASON TO SAY YES!Receive Elegant Gift Packing On Every Order with IceCarats! 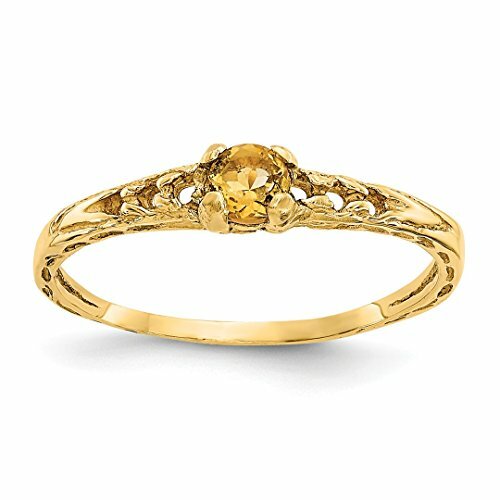 ICECARATS DESIGNER JEWELRY 14K YELLOW GOLD 3MM YELLOW CITRINE BIRTHSTONE BABY BAND RING SIZE 3.00Material Purity : 14KStone Type 1 : CitrineStone Color 1 : YellowStone Quantity 1 : 1Stone Setting 1 : ComponentStone Weight 1 : 0.100 ctMaterial : GoldStone Shape 1 : RoundStone Size 1 : 3.00 mmStone Treatment 1 : HeatingWidth : 3 mmProduct Type : JewelryJewelry Type : RingsSold By Unit : EachMaterial Color : YellowRing Type : BirthstoneStone Creation Method 1 : NaturalStone Type (Other) 1 : Side Stone Mounting(s)Birthstone Month : (11) NovemberOUR MISSION & BELIEFSOur mission at IceCarats is to celebrate our customers and enhance their lives journey, honoring life's memorable occasions and enhancing the beauty of everyday through our extensive collection of quality jewelry.THE ICECARATS STORY - CRAFTSMANSHIP...QUALITY...VALUEJewelry is our passion - IceCarats is devoted to craftsmanship, quality, and value. Each piece hand stamped for authenticityMADE WITH LOVE FROM US TO YOU - QUALITY WITHOUT COMPROMISEWhen you purchase jewelry from the IceCarats collection, you buy with confidence - Lifetime Warranty and 30-Day Returns .ELEGANT GIFT PACKAGING - JUST ANOTHER REASON TO SAY YES!Receive Elegant Gift Packing On Every Order with IceCarats! 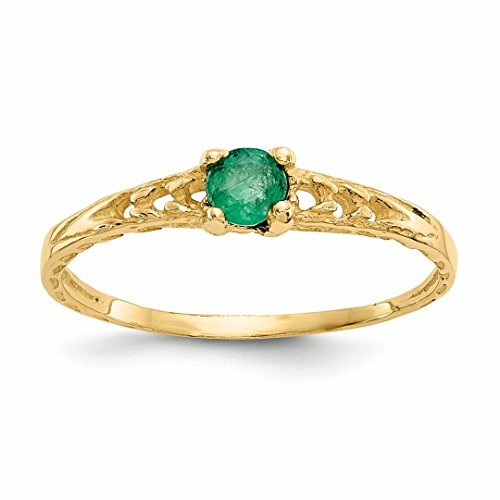 ICECARATS DESIGNER JEWELRY 14K YELLOW GOLD 3MM GREEN EMERALD BIRTHSTONE BABY BAND RING SIZE 3.00Material Purity : 14KStone Type 1 : EmeraldStone Color 1 : GreenStone Quantity 1 : 1Stone Setting 1 : ComponentStone Weight 1 : 0.11 ctMaterial : GoldStone Shape 1 : TBDStone Size 1 : 3 mmStone Treatment 1 : Oiling/ResinWidth : 3 mmProduct Type : JewelryJewelry Type : RingsSold By Unit : EachMaterial Color : YellowRing Type : BirthstoneStone Creation Method 1 : NaturalStone Type (Other) 1 : Side Stone Mounting(s)Birthstone Month : (05) MayOUR MISSION & BELIEFSOur mission at IceCarats is to celebrate our customers and enhance their lives journey, honoring life's memorable occasions and enhancing the beauty of everyday through our extensive collection of quality jewelry.THE ICECARATS STORY - CRAFTSMANSHIP...QUALITY...VALUEJewelry is our passion - IceCarats is devoted to craftsmanship, quality, and value. Each piece hand stamped for authenticityMADE WITH LOVE FROM US TO YOU - QUALITY WITHOUT COMPROMISEWhen you purchase jewelry from the IceCarats collection, you buy with confidence - Lifetime Warranty and 30-Day Returns .ELEGANT GIFT PACKAGING - JUST ANOTHER REASON TO SAY YES!Receive Elegant Gift Packing On Every Order with IceCarats! ICECARATS DESIGNER JEWELRY 14K YELLOW GOLD 3MM WHITE TOPAZ BIRTHSTONE BABY BAND RING SIZE 3.00Material Purity : 14KStone Type 1 : White TopazStone Color 1 : WhiteStone Quantity 1 : 1Stone Setting 1 : ComponentStone Weight 1 : 0.150 ctMaterial : GoldStone Shape 1 : RoundStone Size 1 : 3.00 mmStone Treatment 1 : Not EnhancedWidth : 3 mmProduct Type : JewelryJewelry Type : RingsSold By Unit : EachMaterial Color : YellowRing Type : BirthstoneStone Creation Method 1 : NaturalStone Type (Other) 1 : Side Stone Mounting(s)Birthstone Month : (04) AprilOUR MISSION & BELIEFSOur mission at IceCarats is to celebrate our customers and enhance their lives journey, honoring life's memorable occasions and enhancing the beauty of everyday through our extensive collection of quality jewelry.THE ICECARATS STORY - CRAFTSMANSHIP...QUALITY...VALUEJewelry is our passion - IceCarats is devoted to craftsmanship, quality, and value. Each piece hand stamped for authenticityMADE WITH LOVE FROM US TO YOU - QUALITY WITHOUT COMPROMISEWhen you purchase jewelry from the IceCarats collection, you buy with confidence - Lifetime Warranty and 30-Day Returns .ELEGANT GIFT PACKAGING - JUST ANOTHER REASON TO SAY YES!Receive Elegant Gift Packing On Every Order with IceCarats! 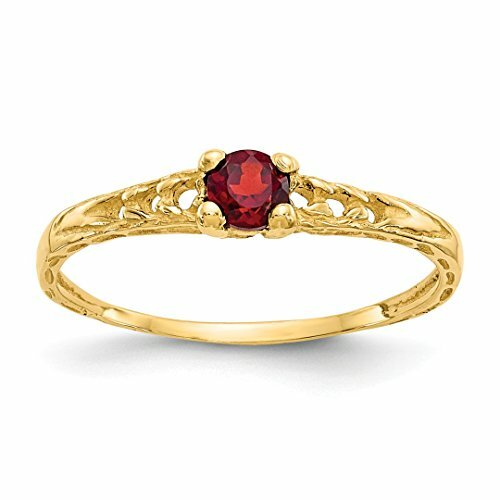 ICECARATS DESIGNER JEWELRY 14K YELLOW GOLD 3MM RED GARNET BIRTHSTONE BABY BAND RING SIZE 3.00Material Purity : 14KStone Type 1 : GarnetStone Color 1 : RedStone Quantity 1 : 1Stone Setting 1 : ComponentStone Weight 1 : 0.130 ctMaterial : GoldStone Shape 1 : RoundStone Size 1 : 3.00 mmStone Treatment 1 : Not EnhancedWidth : 3 mmProduct Type : JewelryJewelry Type : RingsSold By Unit : EachMaterial Color : YellowRing Type : BirthstoneStone Creation Method 1 : NaturalStone Type (Other) 1 : Side Stone Mounting(s)Birthstone Month : (01) JanuaryOUR MISSION & BELIEFSOur mission at IceCarats is to celebrate our customers and enhance their lives journey, honoring life's memorable occasions and enhancing the beauty of everyday through our extensive collection of quality jewelry.THE ICECARATS STORY - CRAFTSMANSHIP...QUALITY...VALUEJewelry is our passion - IceCarats is devoted to craftsmanship, quality, and value. Each piece hand stamped for authenticityMADE WITH LOVE FROM US TO YOU - QUALITY WITHOUT COMPROMISEWhen you purchase jewelry from the IceCarats collection, you buy with confidence - Lifetime Warranty and 30-Day Returns .ELEGANT GIFT PACKAGING - JUST ANOTHER REASON TO SAY YES!Receive Elegant Gift Packing On Every Order with IceCarats! 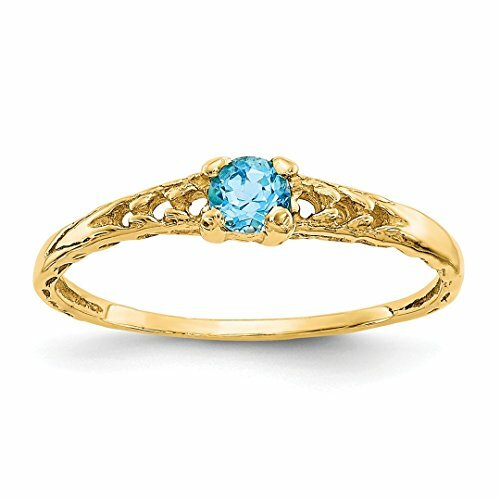 ICECARATS DESIGNER JEWELRY 14K YELLOW GOLD 3MM BLUE TOPAZ BIRTHSTONE BABY BAND RING SIZE 3.00Material Purity : 14KStone Type 1 : TopazStone Color 1 : BlueStone Quantity 1 : 1Stone Setting 1 : ComponentStone Weight 1 : 0.100 ctMaterial : GoldStone Shape 1 : RoundStone Size 1 : 3.00 mmStone Treatment 1 : IrradiationWidth : 3 mmProduct Type : JewelryJewelry Type : RingsSold By Unit : EachMaterial Color : YellowRing Type : BirthstoneStone Creation Method 1 : NaturalStone Type (Other) 1 : Blue ZirconBirthstone Month : (12) DecemberOUR MISSION & BELIEFSOur mission at IceCarats is to celebrate our customers and enhance their lives journey, honoring life's memorable occasions and enhancing the beauty of everyday through our extensive collection of quality jewelry.THE ICECARATS STORY - CRAFTSMANSHIP...QUALITY...VALUEJewelry is our passion - IceCarats is devoted to craftsmanship, quality, and value. Each piece hand stamped for authenticityMADE WITH LOVE FROM US TO YOU - QUALITY WITHOUT COMPROMISEWhen you purchase jewelry from the IceCarats collection, you buy with confidence - Lifetime Warranty and 30-Day Returns .ELEGANT GIFT PACKAGING - JUST ANOTHER REASON TO SAY YES!Receive Elegant Gift Packing On Every Order with IceCarats! 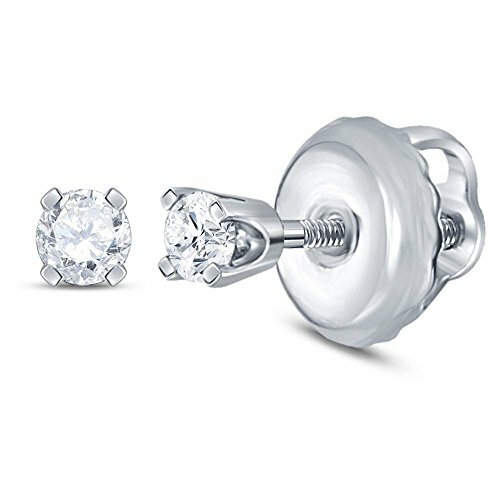 14kt White Gold Girls Infant Round Diamond Solitaire Screwback Earrings 1/20 Cttw. 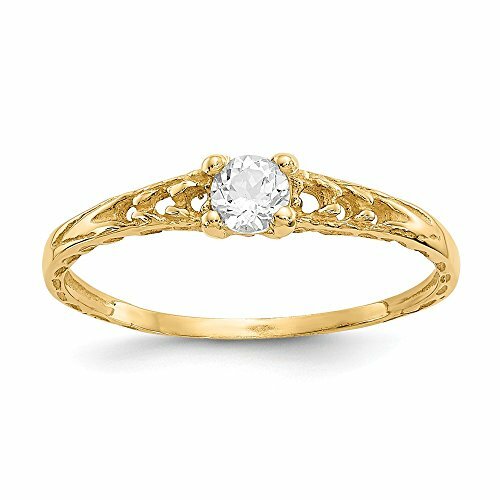 _Combined diamond weight of 1/20 carats total weight represents a range of 0.04 - 0.06 cts. t.w.